Hi, this is my quick notes. You can create viral quiz website with wordpress. It is very easy. I have worked on WP quiz pro last night and found out that it offer amazing features for viral quiz. It has some features we cannot get in other’s viral scripts. WP quiz is free version, but you have to pay for WP Quiz Pro version. Here is a sample of my website built with WP quiz pro. Try it and give me some feedback. (And if you want to have pro version, let me also know. Coz I still have WP Quiz Pro for 4 domains). It offers a lot of quiz features and also very easy to create it. The best part is because you are using WordPress, you can use other SEO plugin tools to rank your quiz website easily at Google. Hello, pls I want to have pro version of the WP Quiz pro. How can we get in touch? HI, what theme you use on https://lovetest.fun? Which one do you like the most? The nametestapps or this? Which one give more revenue? Thanks. Hi, lovetest.fun is my testing site. It is developed with WordPress with WP Quiz plug in. All are free. 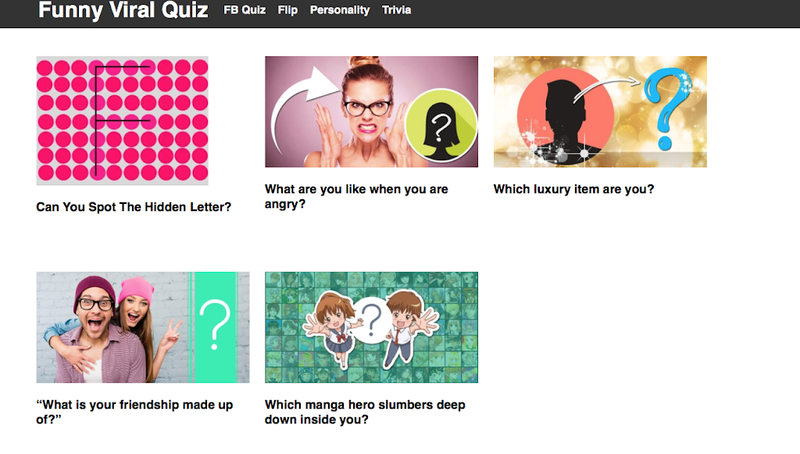 If you want to create personality, trivia type of quiz, WP Quiz plug in is good. And it is easy to handle it. You have more control over your website because you need to develop yourself from scratch. If you have existing wordpress blog, you can easily add quiz page to your blog. But I haven’t put Ads code on this website yet as I don’t have much traffic on this website. To answer which one give more revenue, I will write a new blog post tonight which is a revenue comparison between nametestapps and phpviralquiz.